Please, send me more information on this property: MLS# 64466199 – $369,000 – 2019 Longhorn Drive, Houston, TX 77080. WOW! Completely Remodeled Spring Shadows Beauty with a Saltwater POOL! Cul-de-sac street, no thru traffic, Absolutely Stunning Kitchen with top of the line Granite Counters, SS Appliances, Custom Cabinets, Gas Range. French doors all along back of house overlooking Gorgeous Sparkling Pool. Pool is plumbed for a waterfall. 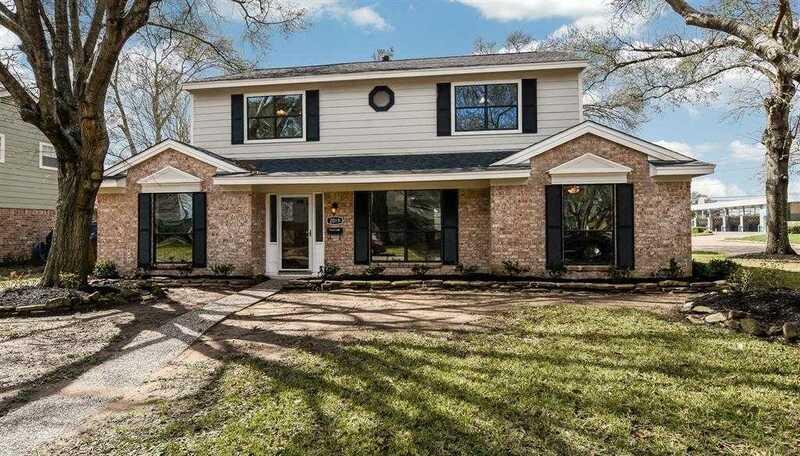 Master Retreat with Remodeled bathroom, Lots of Closet Space, Dual sinks in both baths, High end flooring throughout, Custom Lighting Fixtures, Fresh New Paint, Custom Shutters & Blinds. Double Pane Windows, Recent A/C. Counter depth french door fridge stays! Too much to list! No flooding. This home is ready to entertain with its downstairs guest suite and full bath. Journey upstairs to the 2nd floor and really spread out in the massive great room, large dining space and bright airy kitchen with large island. For some peace and quite, the 3rd floor offers up the Owner’s Suite, 2 secondary bedrooms, and a 2nd full bathroom. With upgraded kitchen hardware including stainless steel appliances, granite countertops and 42 cabinets. The owner’s bath features a relaxing shower. After a long hard day relax al fresco on your 2nd floor deck. What could make this home better? It’s on an oversized corner lot! Don’t miss out on this rare opportunity to live just minutes from the fine dining and shopping of Memorial City and City Centre. Available for August 2019 Move-In! This is a gorgeous contemporary/modern stucco home with beautiful rich hard wood flooring through out the home. The open floor plan concept is extraordinary to enjoy and entertain guests with. The kitchen has amazing cabinetry with granite countertop space and a gas cooktop for the cook to enjoy! Elegant upgrades through out the home with many windows making it light and bright as well. There is a half bath on the first floor. This home is a hop and skip to the water front recreation area to enjoy sunsets, fire pit, relax, and entertain with guests. The Master bedroom is spacious with a bonus room attached for all your extra needs and wants! The master bathroom as a Jacuzzi tub as well. Plenty of walk-in closet space. The laundry room is huge for your large side by side washer and dryer too. The third floor is a 4th bedroom with a full bath. This 4th bedroom can easily be converted to a game or media room! Schedule your tour now as you will be impressed! This home is ready to entertain with its downstairs guest suite. Journey upstairs to the 2nd floor and really spread out in the massive great room, large dining space and bright airy kitchen with large island. For some peace and quite, the 3rd floor offers up the Owner’s Suite, 2 secondary bedrooms, and a 2nd full bathroom. With upgraded kitchen hardware including stainless steel appliances, granite countertops and 42 cabinets. The owner’s bath features a relaxing shower. Don’t miss out on this rare opportunity to live just minutes from the fine dining and shopping of Memorial City and City Centre. Available for July 2019 Move-In! This two-story home is a show stopper! With 1st floor gathering room that opens into a beautiful kitchen and ensuite café makes it ideal for entertaining. The kitchen features upgraded countertops and 42 upper cabinets along with stainless steel appliances. The private owner’s suite on the 2nd floor will be your quiet retreat with beautiful double vanity sinks in owner’s bath, tray ceiling in the bedroom. The spacious covered backyard patio is a great place to entertain guests or enjoy a night outside. Not to mention, a spacious driveway for family and guests to park. Available for August 2019 Move-In! This two-story home is a show stopper! With 1st floor gathering room that opens into a beautiful kitchen and ensuite café makes it ideal for entertaining. The kitchen features upgraded countertops and cabinets along with stainless steel appliances. The private owner’s suite on the 1nd floor will be your quiet retreat with accents like a beautiful tray ceiling and relaxing bath with double vanity sinks and tile surround shower. The spacious covered backyard patio is a great place to entertain guests or enjoy a night outside. Not to mention, a spacious driveway for family and guests to park. Available for August Move-In! With its premier location offering proximity to main thoroughfares, residents can take advantage of a short commute to work along with the convenience of fine dining and shopping at CityCentre and Memorial City Mall. This two-story home is a show stopper! With 1st floor gathering room that opens into a beautiful kitchen and ensuite café makes it ideal for entertaining. The kitchen features upgraded countertops and cabinets along with stainless steel appliances. The private owner’s suite on the 1st floor will be your quiet retreat with accents like a beautiful tray ceiling and relaxing bath with double vanity sinks and tile surround shower. The spacious covered backyard patio is a great place to entertain guests or enjoy a night outside. Not to mention, a spacious driveway for family and guests to park. Available for August Move-In! Brand NEW energy-efficient home ready March 2019! The Haven features an open family room and guest suite on the first floor. The island kitchen and dining area open to optional front courtyard. Upstairs is a luxurious master suite, game room, and additional bedroom. Located inside the Beltway, Spring Brook Village provides easy access to I-10 and 290 making the commute to work, shopping and restaurants convenient as ever. Known for their energy-efficient features, our homes help you live a healthier and quieter lifestyle while saving thousands of dollars on utility bills. Brand NEW energy-efficient home ready NOW! The beautiful Retreat home features a first floor living space, island kitchen, and large covered patio. Upstairs you’ll find an enticing master suite with sitting area, game room, and two additional bedrooms. Located inside the Beltway, Spring Brook Village provides easy access to I-10 and 290 making the commute to work, shopping and restaurants convenient as ever. Known for their energy-efficient features, our homes help you live a healthier and quieter lifestyle while saving thousands of dollars on utility bills. Beautiful gated community located in highly desired school district!! The home features first floor living, open floor plan and gorgeous finishes. The second floor features the master w/2 large walk-in closets, 2 guest rooms, guest bath and game room and/or setting area. Great home, Great Area, Great School!! !